I recently acquired this watch. I am not comfortable opening the back for photos. It runs perfectly, but before I continue wearing and running it, I plan on having it serviced (perhaps my servicer could take a picture of the movement?). I tried locating an advertisement, but have been unsuccessful. I "guessed" when filling in the Manufactuer Year - it was based on a few ads I came across. Any information you may have would greatly be appreciated. Thank you for the information. I neglected to mention that there are two very small diamonds close to where the band connects. I just looked at the post for the Bulova 23 you referenced. There are only a few differences I noticed. My watch does not have a second hand, and it does not have 23 on the face, but other than that the case looks identical. Hello Sherry Lynn, welcome to myBulova. You certainly have brought us a lovely little watch. I'm not sure that the watch Jaroslav has linked above actually has a second hand so I don't think that differentiates it from your watch. Perhaps when you bring it for service you can also ask the watchmaker to confirm the jewel count in the movement of your watch. 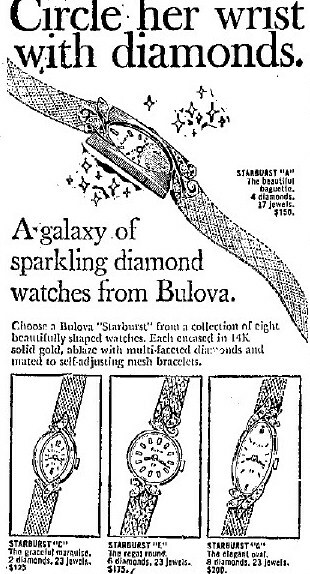 Typically we ID a watch using old advertisements to determine the name of the watch. We do not have an advert showing either your watch or the one linked above so right now I'm inclined to call yours an Unknown model. Also as Jaroslav mentioned, the "N0" on the case back is the date code fro 1970, I have updated the year in the master record. The Bulova Starburst series shows potential. I have also looked through the ads, and have been unable to locate a match. I do not believe the model name 'Bulova 23' is appropriate for the ladies watches with a 23 jewel movement, as I have only seen this model name for men's watches. There are several potential model lines that came with diamonds, and typically if it had a 23 jewel movement the dial would also show a '23'. Unknown model at this time. Very true. I missed that 23 jewel component in the adverts. I suspect it houses a 17 jewel Bulova movement, but could be wrong. Thank you so much - everyone! Despite the fact that we still have a mystery on our hands, all of this is very exciting to me and I appreciate your time greatly! I'm going with Unknown at the moment as there are no adverts suggesting a model. Knowing the jewel count may one day help us with the aid of a matching advert. Hello, I just found out that the jewel count is 17. I hope this helps. Thank you again for all the information thus far - I really appreciate it.